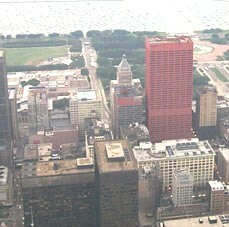 Greetings from Chicago, Illinois, Where the Roads Begin! Limited Time - Route 66 tour for 66% of Regular Price! For more Info on TOURS -- Click Here! For more Info on BOOKS -- Click Here! 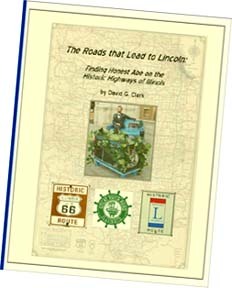 The Roads that Lead to Lincoln A guidebook and history overview of Abraham Lincoln in Illinois and related sites along the state's Scenic Byways: Route 66, Great River Road, and Lincoln Highway. 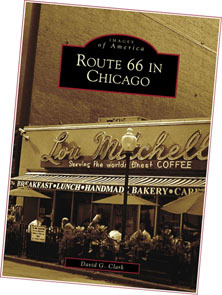 Images of America: Route 66 in Chicago Book from Arcadia Publishing. 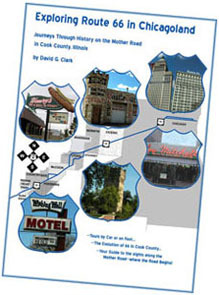 Exploring Route 66 in Chicagoland A guidebook and history overview of the Route 66 corridor and thoroughfares in Cook County. 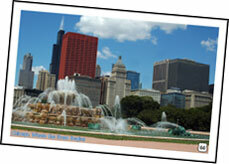 Guided Walking and Motor Coach Tours to Chicago Highways Available! Preservation efforts and research concerning the historic Castle Car Wash, located on 66 on Chicago's West Side. Story and Pictures: On the Trail of the Named Highways from Chicago to the Southwest. 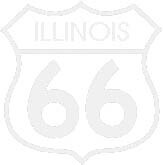 In 2008, the Windy City Road Warriors explored the state of Illinois via a triangular route that took us southwest from Chicago along Route 66, north along the Great River Road, and east back to Chicago along the Lincoln Highway. In The Roads that Lead to Lincoln our experience is combined with research to present the story of Mr. Lincoln and his family's contributions to the history of the state. The Roads that Lead to Lincoln first takes a whimsical look at the commercial abuses of Lincoln's name, likeness and legacy. We then trace Lincoln's paths from his family's subsistence farm to the growth of his legal and political careers, and how those careers influenced the rise of Illinois as the crossroads of the nation and the Gateway to the West. We look at the nation mourning, as the Lincoln Funeral Train brings his coffin back to Illinois for burial. Then we detail the connections of Lincoln and his family to the cities and villages along Route 66, the Great River Road, and the Lincoln Highway in Illinois. In the course of my historical research of Route 66 and its evolution in Chicago, I acquired a large collection of postcards, vintage photographs, maps, and periodical images that stand as witness to Chicago's highway history. In Route 66 in Chicago these artifacts are brought to life as we explore the connections between the Windy City and the Mother Road. 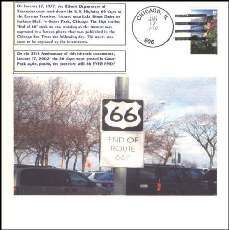 Route 66 in Chicago explores the changing look of Route 66's starting point at Chicago's "route center" intersection of Jackson Boulevard and Michigan Avenue, which was once considered one of the busiest crossroads in the nation. Vintage and modern images show the connection between 66 and Chicago's transportation past of waterways, native American footpaths, and transcontinental railroads. Symbols of Chicago's financial wealth are shown to interpret the flow of commerce between the city and its transportation corridor hinterland through downstate Illinois and beyond. We look at the dining, lodging, and entertainment businesses that grew along the 66 corridor to serve Chicago's visitors. Finally, we examine the devastation caused by the coming of the interstates, which siphoned through traffic away from the 66 corridor, and we look forward with hope that the remaining 66 legacy will help in the corridor's economic uplift. As towns along the Route 66 corridor from Tulsa to Albuquerque and from Odell to Barstow have found ways to preserve and celebrate their highway history, Chicago, where the road BEGINS, has done next to nothing to develop its Route 66 heritage. This often leaves visitors frustrated at the very beginning of their "California trip." With Exploring Route 66 in Chicagoland, the tourist can finally learn the history that shaped U.S. 66 in the Windy City and in all of Cook County. Exploring Route 66 in Chicagoland will help you get the most out of your adventure. So, settle into your recliner, fasten your seat belt, or tighten your shoelaces--no matter how you take the journey, it starts HERE, my fellow Road Warriors, in a city named Chicago! 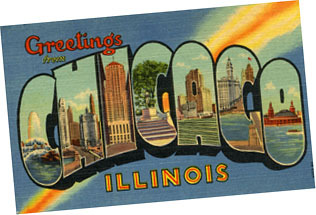 Click here to look at the choices and learn more about the available Postcards and Prints showing the Chicago skyline in the Route 66 corridor, Lou Mitchell's Restaurant, the Castle Car Wash, and more! The Windy City Road Warrior has spent much of the last 5 years researching the history of Chicago, its highways, and the sites seen along the way. We also offer 2-hour walking tours of sections of Chicago's Loop, as well as personally narrated driving tours of US 66 through Chicago and its nearby suburbs. Tours of US 32/34 and US 41 also available. For more information, Click Here! The official Route 66 signs came down at the Eastern Terminus of Route 66 in January of 1977. This postmarked cover commemorates the 25th anniversary of this event, when the 66 shield was briefly displayed again! Click here to purchase! © 2004 by David G. Clark. All rights reserved. No part of this website may be reproduced or transmitted in any form or by any means without the express written permission of the author/webmaster. All photos and graphics by David G. Clark unless otherwise credited. The contents of this website are believed to be correct at the time of posting. Nevertheless, the Author/Webmaster cannot accept responsibility for errors or omissions, or for changes in details provided here.